High Dynamic Range Lying – Why is the iPhone failing in Japan? Nayan Ramachandran returned to the States last month; he’d been living in Japan for three years. But where were all the iPhones? An interesting piece about the perception of Apple products abroad. A terrific analysis of ‘Majora’s Mask.’ I kind of giggled when I got to "If this next part sounds pretentious, forgive me and bear with me a little longer. Cool?" I like the preemptive apology for the ensuing analysis; Internet, I cry for you. I don’t always love CollegeHumor, but the animation in this is really good! With the news of the Metroid: Prime trilogy coming to Wii, it’s easy for me to feel all lovey-dovey about Metroid retrospectives this week. Over at 1UP, Jeremy Parish discusses "wall-walking," a little cheat of a glitch that enables the player to simply walk into ‘secret worlds’—and by ‘secret worlds,’ Parish almost certainly means a scramble of pixels never intended for human eyes. 61 Frames Per Second – Samus Aran: Heroine or Space Harlot? 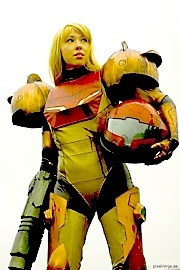 You might not know this, but Nadia Oxford is seriously the Internet’s number-one Metroid expert. In this short and sweet retrospective, Oxford traces game history’s path in search of, as she words it, "the starting mark for Samus’ tumble into game heroine mediocrity." I’d thought I was all bingo’d out—bingo is a pretty popular bridal shower pastime, I guess—but no. These are fantastic. I think I’ll follow the RSSes and play from home!